No, I’m not talking about the 2003 movie starring Julia Roberts and Kirsten Dunst. I’m talking about the world of art auctions. Throughout this course we’ve seen the impact of social media on…well almost everything. The list includes horse racing, venture capital, finding a job, finding work to do, religion, vacations and travel, teaching, terrorism, fundraising, football, basketball, golf, food, dating and on and on. It really has been amazing, social media’s invasiveness, into almost all aspects of our daily lives both good and bad. A week ago, I read an article in Barron’s regarding the impact of social media and art auctions. Current “old school” art auctions are dominated by two auction powerhouses, Christie’s and Sotheby’s. The world of art auctions is being disrupted by social media. Mona Lisa is going online. From upstart Paddle8 to Amazon.com (which started selling art in August) their pitch is the same – we can sell art more cost-effectively and reach a wider audience than the traditional auction houses. We’ve seen this in class on a number subjects. From MOOC’s which open up course content to anyone with an internet connection, to my daily commute with Waze which uses crowd-sourced data to make my daily commute more efficient, the impact of social media has been immediate and profound. Since inception, Paddle8 has held more than 230 auctions, mostly for pieces up to $50,000, generating $40 million in sales. Paddle8 further claims to have 150,000 registered bidders on its platform. By the end of 2013, it will have completed 25 themed auctions, including coming sales focused on performance art and fashion. Paddle8 also successfully runs fund-raising auctions for the likes of the Solomon R. Guggenheim Foundation and The Prince’s Trust. The New York Academy of Art says that Paddle8 is responsible for a 400% increase in pre-event bidding for its fund-raising sales. The firm itself says that, on average, it has helped its nonprofit clients exceed their fund-raising goals by 20% to 30%. Paddle8 is also undercutting Christie’s and Sotheby’s on price. How? Well, in a traditional art auction the seller has to ship their art to the auction house. The seller has to pay shipping, insurance and catalog costs which can add up to a few thousand dollars. The seller has to pay these fixed costs even if the art doesn’t sell. Paddle8, in contrast, lets sellers keep the works in their own space, without shipping it to a central warehouse. By stripping out this overhead and related charges, its fees to customers are about half those of traditional auction houses. Unlike the traditional auction houses, Paddle8 doesn’t physically inspect the artwork it puts up for sale. However, it does verify authenticity via standard documentation, and provides provenance and condition reports. Paddle8 leverages social media sites Tumblr and Instagram to let potential bidders zoom-in for close-ups as part of this virtual inspection process. Paddle8 has found the use of social media to sell art, works fine for artwork valued up to $50,000. Over that amount and potential buyers want to see and touch what they are bidding on. So for the time being, painting and sculptures commanding bids in the millions of dollars will remain with the traditional auction houses. So, while the low-end portion of the market is captured by online auctions, Christie’s and Sotheby’s core upscale market segment is safe. For now. The power of social media is its ability to break down barriers and open up the world to all of us. If the online auction houses can figure out a way to provide a gallery type experience to high-end artwork then no market segment will be safe. The only mistake that Christie’s and Sotheby’s can make is to underestimate social media’s disruptive ability on their business model. Great post Michael. Like you mentioned, it seems like no industry is “safe” from social media. It’ll be interesting to see if Christie’s and Sotheby’s hop on board. I’m not too familiar with their businesses, but do they receive much revenue from these inexpensive auctions (>50,000)? If not, I wouldn’t see it as much of a threat considering the physical aspect of their expensive auctions is so critical to potential buyers (like you said). The most I could see would be promotion/teasing for the actual auctions themselves. Also, do you know if Paddle8 has any other competitors in the online space? Otherwise they seem to be in a very good position. Hey Josh, thanks for the reply. Currently, their major competition comes from Amazon. If you type “fine art” into Amazon’s search you’ll see various works of art listed. Here’s a link to a $285,000 work of art by Marc Chagall, entitled “The Artist and His Wife”. Amazon is obviously using their own platform to put art online, rather than Instagram. Its good to know too, that for $285,000, you get free shipping. Very interesting post! The vast range of different industries affected by the internet and social media blows my mind. I would have never thought of the world of art auctions to be one of them, however I can see that it clearly is. 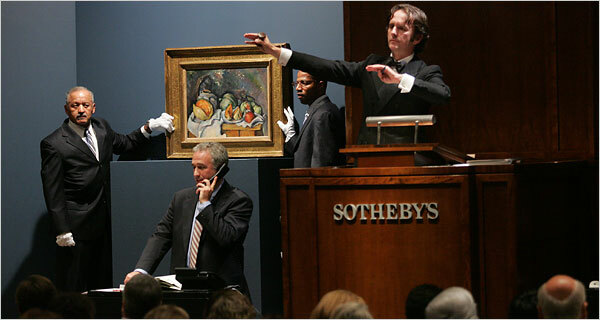 Can you see Christie and Sotheby’s “million dollar auctions” being threatened any time soon by social media. It seems like pieces of artwork priced at such a high amount would need authentication before a buyer would be willing to settle… and I feel that the only way to do that would be to host sales in person. However, perhaps social media can find a solution to this through remedies like relying on people’s reviews for validation. I think we’ll be seeing big changes in the near future to areas of our lives that we wouldn’t expect to be affected by the age of internet and social media. Thanks for sharing. This is really cool, I never thought that people would be interested in spending money on highly priced art pieces on the internet, without ever physically seeing the piece they were buying. Similar to Liz, I think that this is a very cool concept, but I do think that there will still be a portion of art buyers who prefer to buy in person and physically see what they are spending their money on. I don’t know much about the market for expensive artwork, but I would think that this provides an opportunity for more people to access these pieces. People who live in more isolated areas, farther from cities have an equal opportunity as those who live close to the cities. As mentioned in the article, the fact that people do not have to overcome the geographic barriers, and sometimes the time commitment of attending a physical auction, there is an opportunity to make more money as more people can be involved in the bidding and auctioning. Great post, Michael. It’s crazy to think how much social media has become a part of everything in our lives. Even if I had the money to buy expensive art, I’m not sure that I would do it online. While I’m sure that Paddle8’s verification process is extensive, I’m not sure that I would entirely trust it. It’s an awesome concept though. I think it’ll be a great way for lesser known artists to share their artwork without having to worry about the cost of having it in an auction and potentially not making any money. It will also be interesting to see if Christie’s or Sotheby’s responds to Paddle8 in any way anytime soon. A little late on my part, but great post! I had no idea that Amazon.com now sells fine art, and like everyone else, I would be a little hesitant to spend that amount of money on something that I could not inspect beforehand. Even Paddle8, which mostly only sells things under $50,000, makes me a little skeptical. I suppose if you have the money to purchase art at such a price then $50,000 probably is not a detrimental loss if something goes wrong, but money is money! I do like the idea that auctioning art online allows for more people to participate in the auctions. I suppose the condition reports and Instagram/Tumblr pictures are enough for many people to opt for these online auctions as opposed to trekking out to an auction house and paying more for all of the fees that you mentioned. I agree Michelle that spending $50 grand on something I can’t touch or see in person is a little disconcerting. On the other hand, I know people that buy $50,000 cars online without even taking them for a test drive, (I friend of mine bought a BMW by just bidding for it and having it shipped to him) that makes me even more nervous then art, because I don’t depend on art to get to work. As I looked through the offering at Paddle8 I saw artwork for $100 or $250 and I thought, gee maybe I could afford to buy artwork and display it. I think it was the possibility of opening up art ownership to those who might never consider going to an auction house, as you mentioned, as having the biggest potential for this. In this art auction space I wonder just how far social media will allow the participants to go in making all things art a reality. I am impressed by this post because of your comments Andrew to Michelle’s comment on this digital space making art accessible to the masses because of the simplicity of the service. I am equally as intrigued by the user experience of conducting all auctions online, and envsioning a day where live auctions will be completely obsolete because users can Skype in and create the same art buying experience from their couch as they could by actually being there. I am not yet certain is the broad range of potential of the digital space for classic things like auctions is a glorious innovation or a slap in the face to truth artistry and tradtional talents. Interesting topic. Now recluse billionaires don’t need to leave their homes to bid on art either. I think the value actually comes from the convenience for the seller. I think there is room for both online and in person auctions in this space where they will not really step on each others toes. I say this because I still think some people like to go out and be seen in public holding up a paddle and spending an exorbitant amount of money. Also, I can see if the seller is the artist, they may want the piece to be properly valued and may feel the only way that is possible is in person. I am especially glad that Amazon offers free shipping for that $285,000 piece of art. I wasn’t considering purchasing it until I saw that. Game changer. haha great post I really enjoyed it!